FFC is an FAA Certified Repair Station (CRS no. TH4R544M). 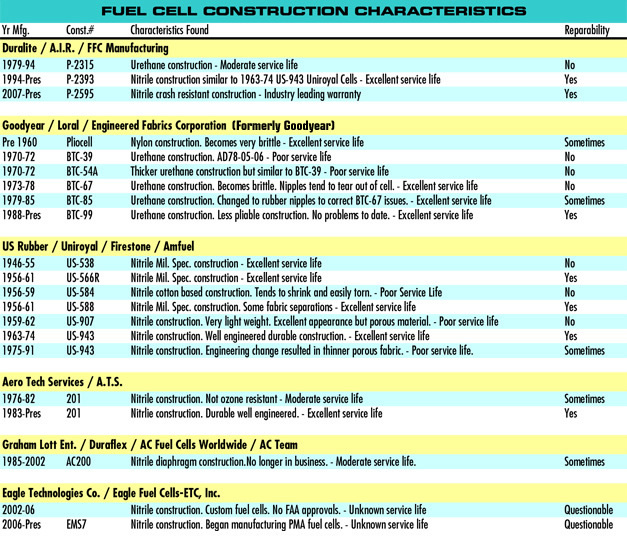 The chart below contains construction specific details exhibited from past and present manufacturers. Ask us about an economical Cessna Aircraft Fuel Tank Repair, Beechcraft Fuel Tank Repair or Piper Aircraft Fuel Tank Repair as well as any other Aircraft Manufacturer’s Fuel Bladder Repair. FFC offers two solutions for the repair/overhaul of your aircraft fuel cell or helicopter float. 2) We can repair your aircraft fuel cell or float. Our exchange inventory is massive and our response time to repair your asset is the best in the industry. All overhauled or repaired aircraft fuel cells are returned to service with a current 8130 and carry a two-year warranty. All overhauled or repaired helicopter floatation devices are returned to service with a current 8130 and a six-month warranty. FFC provides the fastest response time in the industry with the most extensive aircraft fuel cell and float repair capabilities. FFC certification includes the Major Repair, Alteration, Repair and/or overhaul of the above items including inspection and return to service. Lockheed Martin Licensed Hologram Repair Facility. FFC has the engineering staff available for any fuel system alteration needs. FFC offers an economical and timely solution when an aircraft is no longer supported by an approved manufacturer. FFC can support vintage aircraft through our Major Repair Process. FFC supports all branches of the United States Military through the repair of aircraft fuel cells / fuel bladders. Cells are evaluated, repaired and returned to service in accordance with US AIRFORCE TO-1-1-3 or NAVAIR 01-1A-35. FFC is the only Lockheed Martin Licensed Hologram Repair Facility in the world. Call us today at 1-800-647-6148 for Fuel Bladder Repair!